In which Ohtori Academy’s past proves even bloodier (and more symbolic) than its present. And that is freaking saying something. 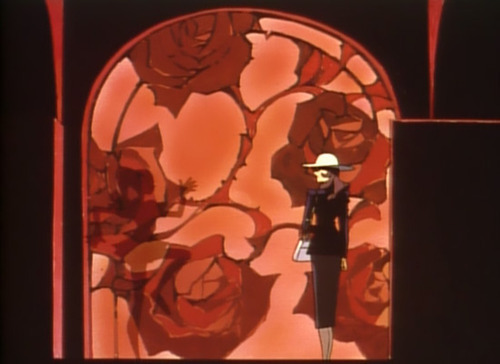 Weeks like this make me wish Utena had even just a slightly better dub, because there’s so much going on visually that I really don’t have time to be reading a character’s complicated monologues and conversations while also basking in imagery and symbolism. As it is, I ended up watching this one twice, once in Japanese and once in English, and I also watched the episode after it so I could remember how this all turned out—and now I get to pretend I don’t know all of that—and also I have a head cold, and good gracious, Ikuhara, writing about your work is going to be the death of me. A lot of what happens this week won’t become fully clear until next week, but there’s enough development and hints that we can lay a bunch of groundwork. So let’s more-or-less ignore the few events that happened in the present and focus instead on the past, and the people who created the boys of the Black Rose. …Oh, but before that, I do want to check in with my favorite group of forgotten duelists. We’ve seen a certain level of increased cohesion among the StuCo since they all were attacked by the Black Rose (when they opened up about the people they loved, when they all agreed to keep Saionji out of their meetings), and that leads us to this week, as they come together to research the mysterious Black Rose Society. They attack the archives together and discuss their concerns within the elevator—and as Vrai astutely notes, this is the first time we’ve seen the elevator “from the inside,” with the StuCo members portrayed as more than ominous silhouettes, simultaneously painting them as less powerful but also as more human, individuals rather than just a shadowy “power” on campus. Also of note here is the information they share once they reach the StuCo room, and of course how that information is conveyed. 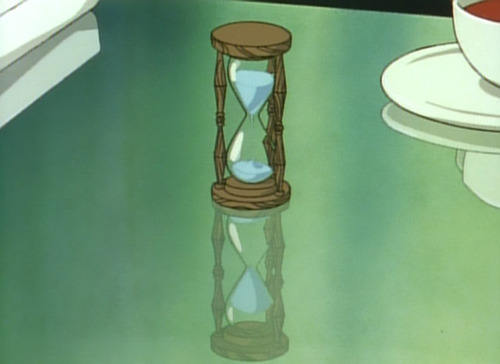 When Jury, Miki, and Nanami combine their resources and theories, they come close to figuring out what’s going on: If the rose crests can only be given out by World’s End (says Jury), then it suggests the same would be true for the black rose crests (says Miki), meaning that whoever’s creating the Black Rose duelists must be connected to and supported by World’s End (says Nanami). Which is all, near as we at home can tell, pretty much true, and would give the StuCo good reason to be suspicious of World’s End and his/her methods. Except that their theories and concerns can’t quite reach one another—they’re drowned out by the roar of an invisible train, an unseen force that rustles their hair and sweeps their voices away. The invisible train is the kind of multi-purpose metaphor that can map onto just about any factor which would keep the StuCo from properly collaborating and taking action against the force(s) manipulating them. 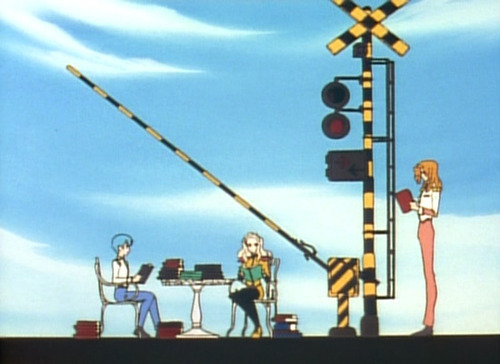 Vrai calls it a “learned helplessness,” pointing out that “they’ve learned from Saionji (who is, you will notice, still not invited to the meetings) that taking action without a condoning letter can lead to serious consequences,” making them “wary to act on anything without a letter giving them permission” (Episode 22). But I think we could also see it as their own personal hangups about fully trusting and working with other duelists (a.k.a. “the competition”), as well as the roar of their own goals ringing in their ears, convincing them that this system is still the best way to achieve those goals, despite their growing suspicions and misgivings. In other words, the StuCo is on the right track (pun! ), but they’re still not able to see what’s barreling right past them, or how it’s keeping them from fully understanding the game they’ve been playing. Moving on to the main event this week, I want to spend some time talking about the professor formerly known as Nemuro, and how Ikuhara uses those pointing hands to help us get a read on both his character and motivations. And I’m going to be quoting Vrai a whole lot here, because why fix what ain’t broke? First, about those pointing fingers: Ikuhara himself says that the pointing fingers are “telling you that there’s someone controlling the laws of this world.” Vrai rightfully points out that the controller is the director (i.e. Ikuhara himself), although I think we could also see them as pointing to the behind-the-scenes machinations occurring in-story as well—namely, to Akio, who sure seems to be pulling the strings on our Nemurionette rather deftly this week, using his affection/jealousy for Tokiko to encourage him to sacrifice the boys and open that “path to eternity.” Anyway, just keep that in mind as we go through Nemuro’s progression throughout this episode, because we’ll come back to those pointing fingers throughout. So! Let’s start with Nemuro as we first meet him: A high school student (seriously—this “genius” is still in his teens) isolated from his peers and deemed a “living computer,” kept in the dark about the truth behind his research, “used” by the initiated for his problem-solving abilities, but never truly brought into the fold. First, Tokiko. She’s the figure who inspires Nemuro to work his hardest on the unnamed project. 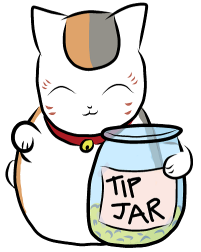 She’s present at every one of Nemuro’s major emotional shifts throughout the episode, triggering a massive reaction from him (hence why the giant pointers take care to point out her teacup just before he’s propositioned by Akio) that sends his character arc in a new and more obsessive direction (devoting himself to the work… and trapping himself in the limbo of Ohtori). 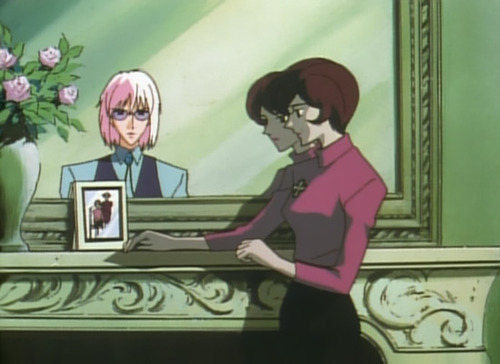 You may have noticed the framed portrait of a butterfly the first time Tokiko and Nemuro are talking, just like the one in the elevator of despair. 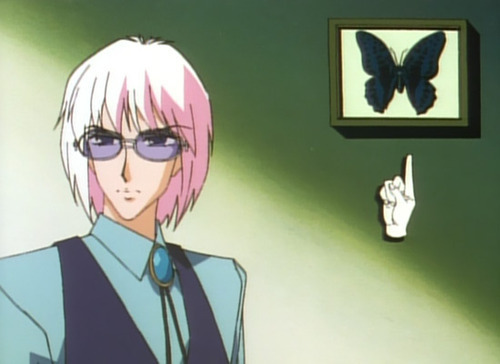 We know from the duelists thus far that the butterfly represents the outermost shell of the duelist-to-be’s desires: the face they show the world, which they might even believe themselves before they’re forced to confront their more complicated inner thoughts. And you’ll have noticed too that when Nemuro comes to the house while Tokiko is away, the butterfly has become a leaf – the final stage of the picture’s devolution, when we reach the core desire that’s driving that duelist. Hence, we come to Mamiya. All of this is helping prepare us for the final arc of Utena, where things will get a whole lot more symbolic and we won’t always have those helping hands to guide is through our characters’ unspoken emotions and motivations. Of course, it’s not just about that—it’s also about painting a picture of the man who’s been running the Black Rose Saga, showing us who he was and how he became what he is today. And how, exactly, did that happen? Through a combination of social isolation, manipulation, and a desperate, clumsy desire to both love and be loved. Not all that different from our many other duelists, really. I’m on board with this reading, but (because I am for whatever reason determined to boil all these complex characters down to their “fatal flaws”) I also feel like we can expand it a bit to ascribe it to Nemuro’s entire personal journey. Nemuro is the robot girl not just because of his “robotic” nature in the early going, but because he is always so susceptible to suggestion—or, more specifically, to the expectations people heap upon him. The other students expect him to be a “living computer” and so he acts like one; Tokiko and Mamiya expect him to be someone worthy of their respect and so he becomes that, working like a man possessed to achieve Tokiko’s dream and save Mamiya’s life; and, finally, Akio expects him to take the path “prepared for him” (NOTEWORTHY: The speech we’ve come to associate with Mikage is an echo of the one Akio gave him decades ago, one more sign of how thoroughly he embodies the suggestions/expectations of others) and Nemuro follows through once more, encouraging and likely facilitating the fire that Mamiya (supposedly) started. Vrai notes that the “pink shading” thrown on Nemuro during the final sequence “is a result of the light of… the fire that Akio persuaded” them to set, literally casting Nemuro in Akio’s shadow (Episode 22). 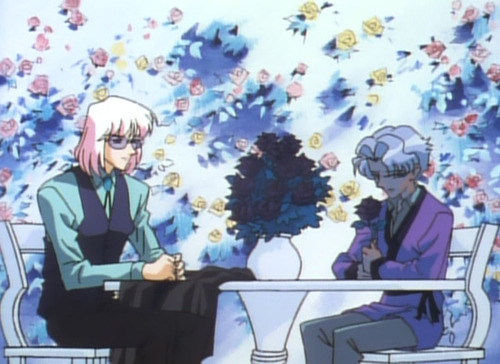 We’ll talk a bit more about colors—particularly the pink shared by Mikage and Utena—next week, but for now I just wanted to use all this to highlight Nemuro’s willingness to fit into the boxes assigned to him by the people he encounters throughout this episode, and how thoroughly that defines his actions and life. This episode is all about time, or more specifically the cessation of it. I mentioned a few weeks ago that time at Ohtori seemed to be moving kind of strangely, but this is the first, er, time we see that depicted in such clearly impossible ways. Nemuro’s research is connected to “revolutionizing the world,” which is itself connected to “attaining eternity,” which hearkens back to both Saionji’s desire for “something eternal” as well as the “something eternal” that Utena’s prince supposedly showed her. So yeah, probably this whole “eternity” thing is kinda important. And both Tokiko and this episode are right—there is something wrong about that.